At Pentagon, Trump Declares His Aim Of 'Rebuilding' The Military : The Two-Way The president met with the military brass and signed an executive action that calls for bulking up the military. He also signed a measure that freezes immigration from seven mostly Muslim countries. 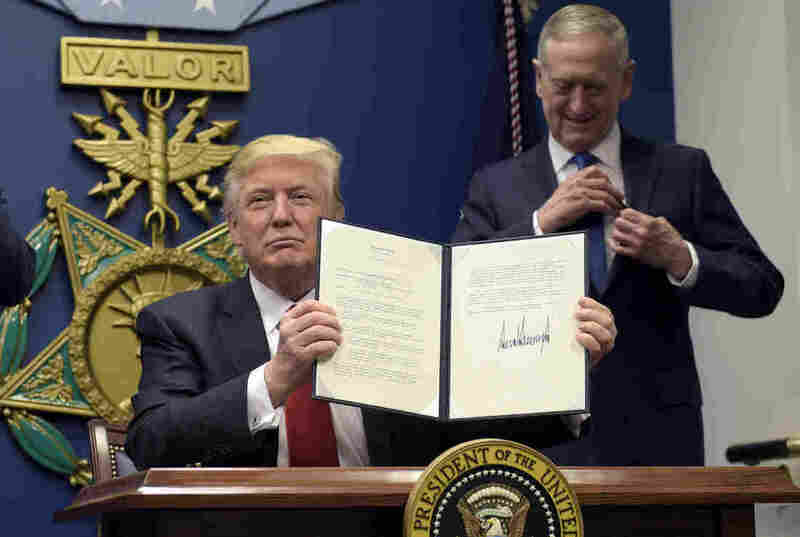 President Trump, with Defense Secretary James Mattis, shows his signature on an executive action to rebuild the military, during an event at the Pentagon on Friday. President Trump paid his first presidential visit to the top brass at the Pentagon on Friday afternoon and announced his intention to provide a wide range of new resources for the U.S. military. "I'm signing an executive action to begin a great rebuilding of the armed services of the United States," the president said in a brief ceremony that included the swearing in of the new defense secretary, James Mattis. "We're developing a plan for new planes, new ships, new resources, and new tools for our men and women in uniform," Trump added, though he did not provide additional details. The president signed a separate order that freezes visas and immigration from seven mostly Muslim countries, a move that had already drawn heavy criticism as word began to leak out earlier this week. "I'm establishing new vetting measures to keep radical Islamic terrorists out of the United States of America," Trump said. Earlier Thursday, Trump said he still believes that torture works as a way to extract information from detainees, but that he would defer to Mattis, who opposes such measures. "I don't necessarily agree," Trump said, following a meeting with British Prime Minister Theresa May. But, he added, referring to Mattis, "He will override, because I'm giving him that power." During his Pentagon visit, Trump met with Mattis and the Joint Chiefs of Staff, his first such gathering with senior military leaders at the Pentagon since he became commander in chief a week ago. By all appearances, Trump and Mattis have a good relationship and share a belief that the military could use more manpower. However, a number of their stated positions have been at odds. For example, Mattis is a strong believer in long-standing U.S. alliances, including NATO, which Trump has called obsolete. The president also has sent contradictory messages with his own statements. While calling for a bulked-up military, which currently has an annual budget of some $600 billion, Trump has also pointed to expensive programs, such as the F-35 Lightning II. The next-generation fighter is the most expensive ever, with a price tag currently pegged at around $130 million per plane. Trump says the cost needs to come down. Trump has also called for a stepped-up military campaign against the Islamic State, though he did not mention the extremist group in his brief public remarks. During the election campaign, Trump boasted that he had a secret plan to crush the Islamic State. At times, he sharply criticized the generals he now commands, but he also said he would give them a month to come up with a new plan to fight ISIS. The president repeatedly dismissed then-President Obama's military campaign against ISIS as insufficient. "The last administration had a strategy that was more of an indirect approach, and it was certainly a long-term approach," retired Army Lt. Gen. David Barno told NPR's Morning Edition. "I think President Trump might be looking for something with some quicker results and that could put some new options on the table." Obama ordered an air campaign against the extremist group in the summer of 2014 as ISIS was surging across Syria and Iraq. The U.S. military, working with local forces, has pushed the Islamic State out of all Iraqi cities except Mosul, where an offensive has been underway for the past four months. ISIS has also lost territory in Syria, though it still holds key cities and towns in the eastern part of the country. The U.S. currently has about 6,000 military personnel in Iraq and Syria, including trainers, advisers and special operators. Under Obama, the U.S. focus was on the air campaign, and the U.S. forces are not supposed to be involved in combat. The U.S. forces have been guided by the mantra of working "by, with and through" local forces in Iraq and Syria, rather than having a large U.S. force leading the way. Trump could "certainly use more military force. He could elect to put American boots on the ground in larger numbers," Barno said.